Thanks to a reader of my blog, who made me aware of another slow film, I had the chance to dive into a hugely photographic piece of cinema. A while ago, I wrote a short post on Bovines by Emmanuel Gras. It is a film without dialogue. Just pure beauty. And cows. It traces the often overlooked lives of cows throughout the four seasons. It still is the most peaceful slow film I know. 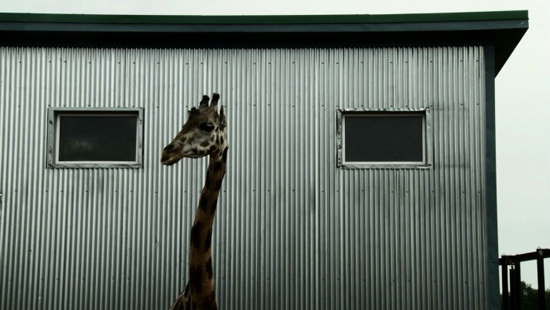 Bestiaire by Canadian filmmaker Denis Coté is not much different at first sight. It is about (wild) animals in Parc Safari in Quebec (“Africa in the Heart of Canada”). Again, the changing seasons play an interesting role. Bestiary, or The Book of Beasts, was a medieval collection of physical descriptions of animals, often written in such a way as to highlight an animal’s special meaning or position in the world. This seemingly little detail is in fact very significant. The animals we see in the film – horses, giraffes, bears, zebras – have been deprived of their special meaning in the world. They are all the same. They are an object of attraction for both the employees, and the tourists, who flock to the park in spring and summer. They have been deprived of their special meaning because they have been put into captivity, where they cannot be the animals they really are. They cannot be wild. In winter, especially, when the animals are put into indoor shelters, we see, for example, zebras wanting to break out of their cage. Thus, the first half of the film is a bit depressing if you have a heart for animals. Aesthetically, Bestiaire is stunning, though. It feels like a photo album from time to time. Coté is certainly one of those filmmakers with an incredible eye for frame composition. The camera is always static, as is often the case in Slow Cinema. I suppose that many shots happened by pure chance because it looked as if Coté had put the camera somewhere and had hoped that an animal or two would cross the frame. So while Coté certainly tried to set up the camera in such a way that he could get interesting shots, it is not all due to his work as director / cinematographer. He was very much dependent on the movements of the animals. I therefore see Bestiaire is a collaboration of man and beast, rather than “a film by Denis Coté” alone. Watching Bestiaire might make you think that Coté is a slow-film director. In fact, he is, but his films are less Slow Cinema. I watched his film Curling yesterday, and though it did start off like a Slow Cinema film with regards to its aesthetics (long-take, static camera, medium or long shots etc), Coté moved away from those aesthetics halfway through the film, which confused me a bit. I don’t think there was anything in the narrative that could have asked for it, but then, don’t question a director’s aesthetic choices. You’re wrong about it more often than not. Interesting comment about the animals who lost their place in the world. He films them against non-natural walls, tin roof, barriers. I really liked it. It’s very aesthetic. Côté is not contemplative, in an interview he said that he’s willing to try every styles and genre, depending on the story to tell. Well, precisely what I say in the post. He’s not really a Slow Cinema director because he’s got other films that don’t fit. But this particular film would be part of the canon, to me personally anyway. Yes I agree. I like how you say the animals are co-authors of this documentary. Yes I agree. I like how you say the animals are co-authors of this documentary. This is probably true of all documentaries, the directors are dependent on what the subjects will do (when it is not staged).